The ICSR is the latest upgradation of AIS, evolved out of anoxic-aerobic single tank configuration that has been successfully employed for numerous large scale biological nitrogen removal projects. ICSR has been developed to get best of the Extended Aeration Activated Sludge Process (EAASP) and Sequencing Batch Reactor (SBR), while eliminating the shortcomings of both these technologies. 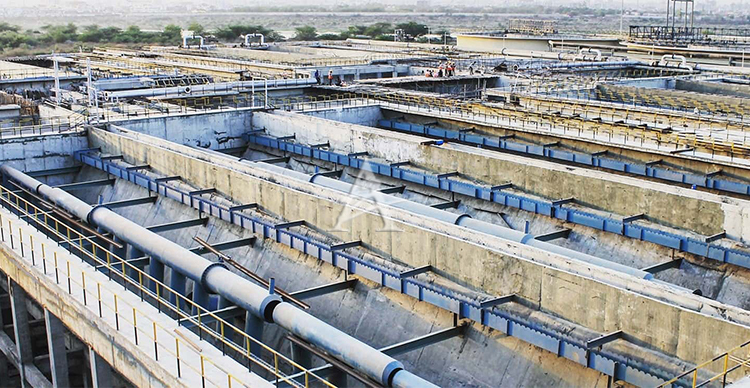 ICSR is a continuous flow (continuous feed and continuous overflow) system like and EAASP, with a dedicated clarifier that is separate from aeration tank. At the same time, it follows the feast-and-famine sequencing philosophy of SBRs, whereby the single tank ICSR is divided in zones that mimic Fill, React and Clarification sequences of a SBR. Due to patented biomass conditioning and induced sludge velocity concept, the ICSR operates at higher MLVSS concentrations than conventional ASPs or even SBRs, thereby requiring smaller aeration volumes. It does not have any moving parts such as scrappers, gears, submersible pumps, decanters or any drives and hence virtually does not require any maintenance or replacements, while also having lower operating cost. ICSR, unlike SBR, is not dependent on automation and can handle variations in feed quality and quantity without any special effort. A 100 MLD CETP has already been completed based on this technology while another 12 MLD is under construction.